The disembodied voice of the dispatcher is the third part of the equation that completes the dynamic of the taxi cab business. Computerized dispatching replaces much of the necessity for radio communication, except for clarifications, in most of the larger cities, but not here in Salem. 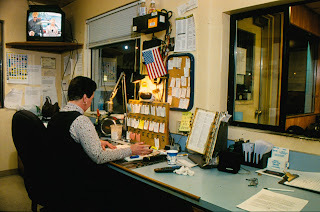 We still use the same equipment that taxi cab drivers have been using for the past 50 years, so the ethereal voice of the dispatcher is as much a part of the landscape for the taxi cab driver, as the fares bodily presence. The dispatcher’s voice and personality can make for either a pleasant shift, or a hellacious one. Women’s voices tend to be friendlier than men’s, but exceptions are noted. Over the years dispatchers, like cab drivers, have come and gone, allowing an opportunity to experience a variety of personalities. Mike, a 350 lb. behemoth from Okahoma, was the first dispatcher that I worked with. He worked the graveyard shift from Midnight to 8:00 AM, and had an Okie twang, with a deep gruff voice. He treated the drivers like they were his personal slaves, and most of the hacks hated him, especially since he never drove a cab. He didn’t know what it was like trying to find an address in an unfamiliar area, on a dark and stormy night, before the proliferation of GPS. So after 15 minutes he would demand to know why you weren’t at your destination, if you weren’t. He got fired for being rude to a customer on the phone, but then my passengers regularly told me that he was rude to them. I guess too many of them complained to the boss. A few months after his discharge, he moved back to Oklahoma, and was killed in a motorcycle wreck. Then there is Keith, the daytime dispatcher, who has strawberry blonde reddish hair and, used to mountain bike. Keith drove a cab, until he got in too many wrecks, and the insurance wouldn’t carry him anymore. That’s how some drivers graduate to the dispatcher position. The dispatcher is a step above the driver, and is his immediate supervisor, in the taxi cab world. Keith work day shift, from 8:00 AM to 4:00 PM, and likes to talk so fast when he gives out calls, that drivers can’t understand him. He also takes delight in how many new cab drivers have quit their first day or week, because of frustration with trying to work with him. He is a strict disciplinarian who will park a driver for a minor infraction in radio protocol, or send him home to shave, if he shows any stubble. Ed Good, the relief dispatcher worked four shifts a week, and treated the drivers worse than Mike, if that were possible. He was a retired prison guard, and drove a cab until his eye sight started going. Between lung cancer from asbestos contamination while he was in the navy, and emphysema, he would have occasional black outs while dispatching. One time one of the drivers found him stretched out on the floor after he fell out of his chair, from an extended coughing spell. He retired after I worked with him for nearly 4 years, and died a few months later. He loved women and had a heart of gold for homeless indigents and ex cons trying to make it outside. Erin, is the bosses daughter, and she’s a relief dispatcher, in Ed Good’s old slot, although she worked another relief shift before that. She started dispatching when she was 18, and has never driven cab. Ed Good trained her to be a dispatcher, so she talks to the drivers like a female prison guard, with a sweet high pitched voice. She will scold drivers old enough to be her grandfather for not following her directions, or questioning her. Occasionally she will park a driver and if anyone tries to give her any trouble, she reminds them who her father is. Her husband and brother are both taxi drivers for the company. Lisa replaced Mike in the graveyard slot, and drove cab for a number of years before that. She had a deep husky voice and loved the “Insane Clown Posse”. She would speak patiently, with occasional dry humor, in an almost motherly way. Two years ago she and her husband moved back to California, where her father is a rocket scientist. Dotty replaced Lisa on Graveyard, after she drove taxi, on day shift for 10 years. Her voice is usually crabby or irritated sounding, but at the same time she’s not harsh or demanding. She gets easily exasperated and takes her job seriously. John replaced Tracie as the swing shift dispatcher, but was already a relief dispatcher for a number of years, while he was still a taxi driver. John is a wannabe stand-up comedian, who used his job as dispatcher to entertain the drivers and their fares with his voice impersonations of Humphey Bogart, John Wayne and Jimmy Stewart. At the same time if a driver is abusing radio protocol, he will verbally discipline him, and even park them. He will trade quips with the drivers and make witty remarks that relate to the subject at hand, in some obtuse way. The dispatcher has complete control over whether a driver has a good shift or bad one. They control the calls, and although there is a protocol for how calls are distributed, without oversight a dishonest dispatcher could easily give good calls to their favorite driver or relative and bad ones to others. Some drivers claim that the dispatchers are always screwing them, by ignoring them when they know that the next call is an out of town prescription run. Some even believe that dispatchers make up fictitious calls to give, to get you out of the way of a good one for their favorite, only to tell you that they called and cancelled after giving the good call out. All drivers are forbidden under pain of dismissal, not to ever do for or give to the dispatcher anything, no matter how small and insignificant, so as not to ingratiate themselves to them. One time I gave Lisa a small statuette of Shaggy 2 Dope, from the Insane Clown Posse.